Paleontologists have unearthed a massive relative of Velociraptor in South Dakota. It's common knowledge nowadays that the velociraptors found in Jurassic Park and its sequels were a little bit larger than life: the real animal stood no taller than a turkey. Still, vicious, human-sized raptors did exist, and the entire raptor family included some gigantic creatures no less agile than their tiny cousins. Enter Dakotaraptor, the latest branch in the Dromaeosauridae tree, which lived about 66 million years ago. The feathered, possibly winged, Dakotaraptor was massive, at over seventeen feet long. Actually, "massive" is not quite the right word; paleontologists believe it was an extremely lightweight animal, with its hollow, bird-like bones, moving at a blistering speed through the prehistoric landscape to capture its prey. "It really was the Ferrari of competitors," says Robert DePalma, head of the research team that uncovered the fossils. "It could run very fast, it could jump incredibly well, it was agile and it had essentially grappling hooks on the front and rear limbs. These claws could grab on to anything and just slice them to bits. It was utterly lethal." My inner dinosaur fan girl is squealing with morbid glee. The newly-described animal was discovered in Hell Creek, South Dakota, in 2005. Paleontology fans might recognize that name - it's where the most famous and complete examples of dinos such as tyrannosaurus rex and triceratops come from. Pieces of the animal were assigned to different species, at first - it took several years before it occurred to anyone they all might belong to the same, terrifying predator. 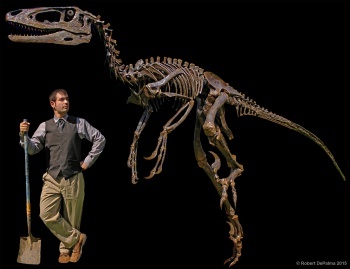 It's worth noting that Dakotaraptor is not even the largest raptor yet discovered. That honor belongs to Utahraptor, which was about 33% larger than the former and lived over 60 million years earlier.